While keeping our finger on the latest industry trends, we also catch a few news bites worth sharing. When we’ve got news, you’ll be the first to know. 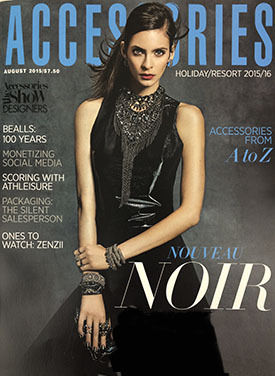 We’re featured twice in Accessories Magazines August issue for Holiday/Resort 15/16. They’ve featured both our crystal lips key chain in sapphire blue and our suede fringed scarf in light camel. Find these trendy items and much more in our showroom!